KFXM had its beginnings in the 1920's at several different positions on the Inland Empire's radio dial. The most most recent success as a top 40 station during the golden years of top 40 AM radio in San Bernardino, California, spinning the hits at 590 on the AM dial. It lasted well into the 1970's. However, like all other AM's of its kind it is long gone. 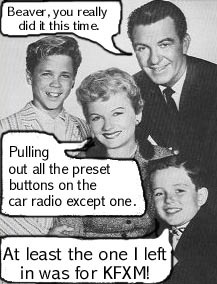 Oldies stations started springing up on the FM band as far back as the late 60's. What remains today are oldies stations playing the same songs over and over, minus most of the 1950s and early 60s, what kind of oldies station is that?